Stylized 3D image of a quantum dot OR gate. Red dots represent the electron positions, and the quantum dots are represented by the confining depressions. Credit: Brad Hesson. For decades, the “holy grail” in the relentless drive toward the smallest, most efficient, fastest computers has been the achievement of atomic electronics. Exacting deployment of atoms as individual building blocks that can perform logic operations is the ultimate in miniaturization, and, it has been thought the ultimate in performance too. While many notable advances have been made since the first atomic patterning by Eigler et al. 28 years ago, all approaches suffered from debilitating limitations; the two biggest being strong “mixing” of states between the atomic patterns and the substrate, and limited thermal structural stability. While there is a lot more work to be done, we believe we have addressed these two key issues with the use of patternable atom-sized silicon quantum dots. Our quantum dots are dangling bonds on the otherwise hydrogen-terminated silicon surface. They are isolated from and do not mix with the silicon substrate’s bulk states, they exist in the band gap of the material, and are structurally stable to 200 °C. Circuits made of these, as demonstrated in our paper, sequester individual charges in the dots, which through input controls we can deterministically place within the quantum dot structures. Binary information is encoded as electron position. Our supervisor, Robert Wolkow, dreamed of using these dots for computation two decades before this paper was realized. At the time, he was held back from immediately advancing the foundational work due to a lack of tools not only to manipulate the single atoms with sub-angstrom precision, but also tools that could read the electron outputs and dynamics. New work has advanced the challenging atom manipulation capabilities for our substrate to a point where we can now deterministically place and erase our quantum dots at will. Furthermore, while the group had historically been a scanning tunneling microscopy one, we have recently added the near field-free and single-electron sensing capability of atomic force microscopy to the lab. This has opened the door for us to test the delicate charge arrangements within our circuits in a gentler way, without substantially perturbing the system. We still have many challenges remaining, but we think our system is a very attractive candidate for true atomic electronics. Our approach provides a platform for a new class of ultra-fast, ultra-power efficient, and ultra dense computing. It is the focus of on-going work to show extension of logic functions beyond the demonstrated OR gate. A macro-to-atom interface is well advanced and will soon allow external actuation of atom scale circuit elements. Because the gates and wires between gates require only single electron-level electrostatic energy barriers be overcome and because no conventional current is required, power consumption is expected to be extremely low. Experimental characterization of that bit energy is in progress. The work described here may enable a Beyond-Moore technology, combining exceptional speed with ultra low power consumption and also extreme low weight and size – a very green technology. Co-authors from BASIL. 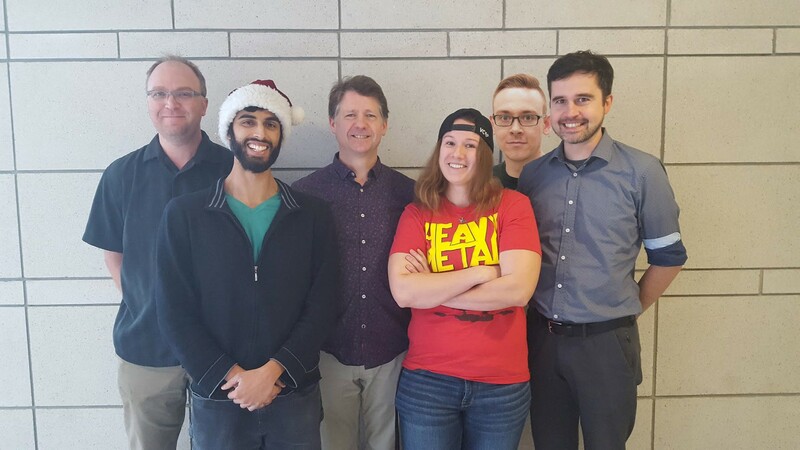 Left to right: Jason Pitters, Roshan Achal, Robert Wolkow, Taleana Huff, Wyatt Vine, and Thomas Dienel.